Reuben Moreland has been catching the eye of top industry pros from a young age. His award-winning competition act has brought him all over the world. In his DVD debut, Reuben shares a close-up miracle that he's been honing for years. 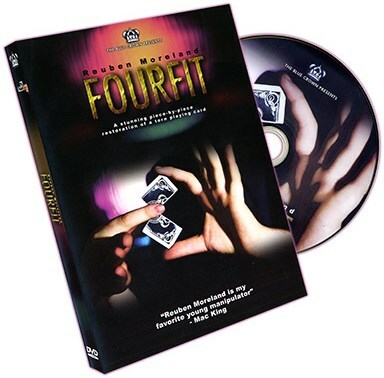 Fourfit is a stunning piece-by-piece restoration of a torn playing card based on an original concept by Max Cron. Each restoration is more magical than the last, with the pieces simply fusing together with a light touch. You can use a regular, borrowed deck of cards and the card can be shown on both sides after each piece is restored. The reassembled card can even be handed out as a souvenir! Reuben teaches Fourfit in extreme detail, and even provides additional handlings and tips so you can customize the routine. Find out why close-up masters everywhere are hailing Fourfit as one of the best torn and restored card effects to come along in years! A really nice torn and restored card. Not the easiest but pretty practical and looks great!